So you have your home for sale and somebody has written you an offer, should you accept it as it is, or should you counter offer? This is a question that many people selling a home will face, and the answer will be unique for each and every one. If you send a real estate counter offer the buyer, you risk chasing the buyer away or reducing their desire to actually buy your home. And if you do not counter the buyer, then you're leaving money on the table, right? What if there was a sure-fire way to know whether or not to send a counter offer back to a buyer? Sometimes you have to change something in an offer that you receive from a buyer. Even if you agree on the price and key dates, there might be a descriptive mistake in the purchase offer which requires a change. Any such change to an offer is considered a counter offer, even when the key elements of the offer remain unchanged. It is important to understand this, as my general guidance will be to avoid having to counter offer a singular buyer (more on this later). But if the offer is poorly written, or if it contains erroneous information, then you will have to counter offer regardless of how much you like the "deal." There are many reasons why you should not counter offer when selling a home. First and foremost, you are in a buyers market, and the cost for chasing away a qualified buyer will likely be far more than the amount of money you had hoped to gain with your counter offer. The real estate graph below shows homes under contract (purple), homes that have closed (green), and the ratio of closings to contracts. 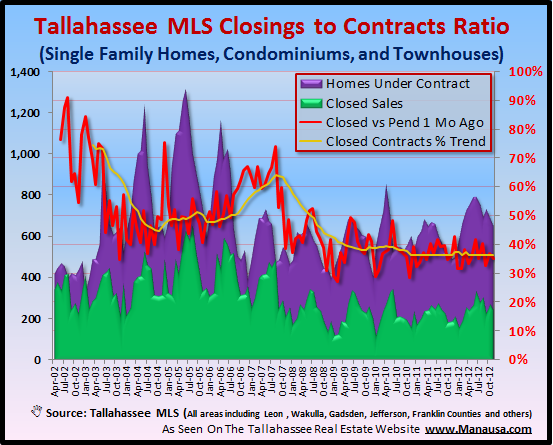 This graph shows us that buyers are backing away from 2/3rds of the contracts that are negotiated and recorded in the Tallahassee MLS. Right now, sellers should be focused more on putting together a closeable sale than on convincing a weak buyer that the home is worth more. 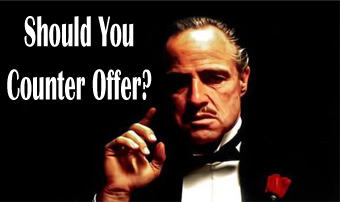 After all, what good is a counter offer going to do for you on a sale that will never close? The key is to get buyers to write you a better offer to begin with! This is the real key to understanding how to negotiate the sale of your home. Did you know that it is possible to make buyers compete for your home? When you have more than one buyer who wants your home, you have the ability to counter offer with near impunity, correct? But most home sellers do not draw enough buyers to their home. They are lucky to get one offer, and then end up scared to counter offer to a higher price. Negotiation is about leverage (control), and you have no leverage when there is little interest in your home. Fortunately, the opposite is true as well. You have great leverage when multiple parties want your home, and yet only one can have it. So how do you gain this leverage? The key to gaining leverage is to price your home exactly right. If you price it too high, you will not attract the right (or enough) buyers to create leverage. If you price it too low, you will attract multiple buyers, but not ones who can afford to compete for your home. There is a "sweet spot" for pricing that allows you to attract multiple buyers for your home, providing there is sufficient liquidity in your local housing market. Finding this exact right price takes experience and knowledge. Your real estate agent should be a recognized expert in your local market if you want this best home price guidance. A survey conducted by the National Association of REALTORS found that 64% of home sellers hired the first real estate agent that they spoke to. When most people first decide to sell a home, they often do not put much thought into whom they will hire or the importance of the real estate company their agent is working for. And this is a huge mistake. When it comes down to whether or not you should counter offer, you are basically relying on the experience and the integrity of the listing agent that you selected. A counter offer could be worth tens of thousands of dollars; did you select your agent because she or he shaved a percent off the commission? The funny thing about real estate is that you can typically hire the best real estate company in the market for 1 percent more than you would pay to get the worst, yet many are drawn to that apparent discount. But how many home sellers factor in the discount when the pressure is on the line and final counter offer guidance is being issued? Do you want somebody who was quick to discount their services to you giving you guidance on whether or not you should discount the value of your home? If you want to know why our progressive home selling plan gives you the certainty of knowing when to accept or counter offer a buyer's proposal, just drop me a note and we can show you how to get the best guidance when you are selling your home.